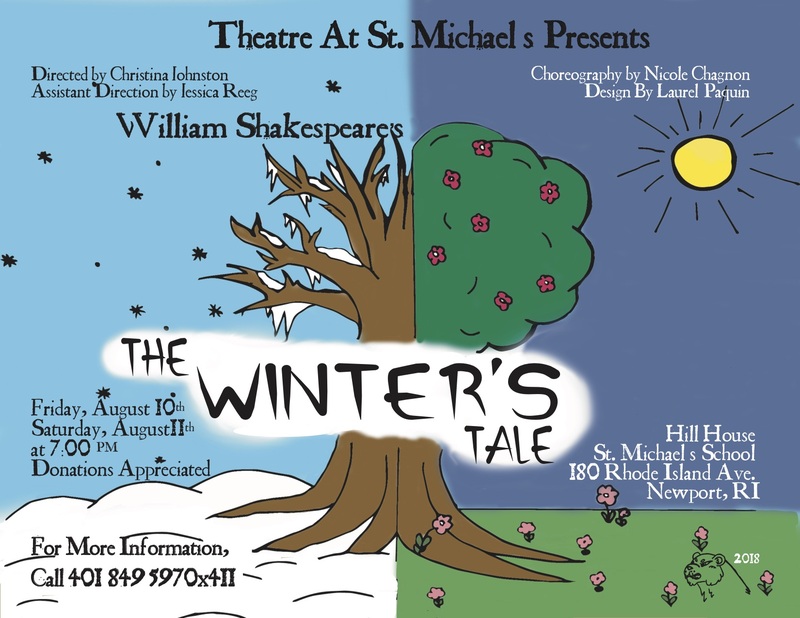 Theatre at St. Michael’s is pleased to present William Shakespeare’s beautiful tragicomedy, The Winter’s Tale, on Friday August 10th and Saturday August 11th at 7:00. Set in the contrasting worlds of a mysterious Oracle and a pair of festive kingdoms, The Winter’s Tale weaves together music, magic, courtroom drama, shipwrecks, and bear attacks. Sicilian King Leontes unfairly accuses his wife, Hermione, of adultery with his best friend, the King of Bohemia. When Hermione gives birth to her daughter, Leontes orders the child to be killed and banishes Queen Hermione, tearing his family and the two kingdoms apart. However, through the intervention of the mystical Paulina, the princess is saved, Leontes repents, and Sicilia softens after sixteen years of turmoil—with the help of a little magic. This performance will feature actors ages 9 – 14, who have been intensively studying the play in a two-week program under the direction of TASM Camp Director Christina Johnston. Assistant direction is by Jessica Reeg, and choreography is by Nicole Chagnon. Laurel Paquin leads a crew of young technicians (also ages 9-14) to design and build the show. The performance is free and open to the public, in the St. Michael’s School Hill House Arts and Athletic Center at 180 Rhode Island Ave in Newport. Donations are welcome at the door. For more information, please contact TASM camp director Christina Johnston at cjohnston@smcds.org, or call (401) 849-5970 x411.